Judy Blume will be speaking at the University of Hartford on June 21st as a fundraiser for The Mark Twain House & Museum. I’ll be interviewing her onstage and taking tons of audience questions. In preparation, I will be reading her complete works and blogging about the experience. Get your tickets here. I have never written a fan letter. I did, once, write to the advice column Dear Sugar, after getting caught up in the beautiful writing of that column and desperately wanting her to speak to me directly. I don't even remember what I asked. I just remember that I wanted to be spoken to. Letters to Judy is, I think, Blume's most important book. Here's the story. 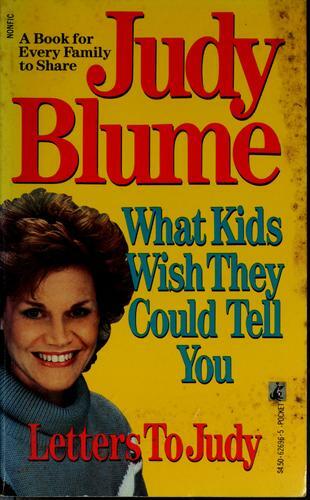 By the 1980's, Judy Blume was internationally famous and heavily censored. She received thousands of fan letters. Most authors, I imagine, would be overwhelmed by that and stop reading them, or have someone else read them. Some very kind authors would write back. A select few might even write a book to address the kids directly. Judy did these things, but she did something else that I think is even better: she collected them and addressed the book to parents. Here, she is saying. Here is what your children are thinking about. They have confided in me. Here is what you need to know. She writes in her introduction: Sometimes I become more emotionally involved in their lives than I should. There are letters that tear me apart, and they will you, too. They do. There are letters about family violence, there are letters about love. They are all short and sweet and lovely and horrible at the same time. This book is also the closest we may ever get to a Judy Blume biography. In her answers to the kids and their parents, Judy talks about her parents, who wouldn't talk about sexuality with her, a summer friend who left her behind for the popular crowd, bedwetting, bullying, you name it. Once again she passes information and reassures her readers. That's her usual MO. But this time, it's for the parents. This book is sadly out of print now. You can get it online, or perhaps stumble upon it in a used bookstore. I imagine that if I were a parent I would seek it out one way or another. It's easy to forget how we thought as children. Luckily, Judy's got a whole archive of experience just waiting to be researched.